1) Went to the Belle Meade Plantation for a field trip. It was awesome!!! We learned all about how the children of the house celebrated Christmas in 1880. 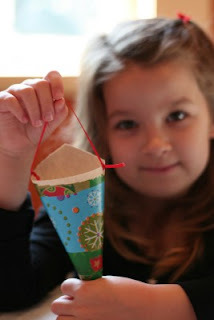 We did a Christmas craft where we glued torn up scraps of paper onto a cone. Mine turned out neurotically perfect after some trimming. 3) Had a yummy lunch at Baha Fresh. Mucho gaucamole was eatenup-o (to use a word I made up). 4) Stopped by the hospital where a friend works to give her some birthday goodies. I taught Caroline how to press the elevator button with her elbow. Yep. I did. Pretty proud of myself too. 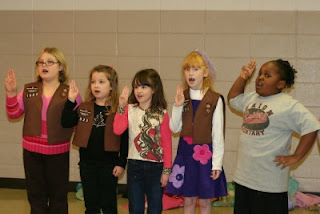 5) Learned all about cookie sales at Girl Scouts (get ready people - I'm comin' for you). Then we had a ceremony where Caroline received six badges! Yippee! She's up to 8 now. 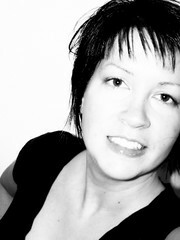 6) Watched Wife Swap and learned how NOT to treat my husband. Then watched Super Nanny and remembered why I don't have six kids. 7) Went shopping all by myself at Publix and Target. Joy!! The angels sang. Or maybe that was just me singing out loud in the parking lot. Ooops. I did actually have an embarassing moment. I was in the self-pay line at Publix and short a nickel. I had to ask a lady next to me to borrow one then I informed her that I wasn't really borrowing it 'cause she wouldn't be getting it back. She seemed okay with that. My face turned red. 8) Got behind my Pastor on the way to Target and then we both pulled up to a four-way stop side-by-side. I carefully avoided stopping next to him. I stayed a little behind his car. I wanted to avoid the "do I look? do I wave? can they see me?" situation. Whew. That was close. 9) Came home, wrapped some gifts. Almost done. here I am! I'm pooped! Heading to bed!! Love the six kid comment! I watched too. It was too good. I really think that the family did a really great job. Six is so many, and it's not like they had then one at a time. It was like BAM! Here's mine, There's yours, make a few more in under two years... OMG! Did YOU realise we have six kids!? You make me laugh! Wish I had such productive days. Eat, dishes, sleep, repeat! Jack ONLY naps while nursing...I know, bad mommy. I need a naptime intervention! I so loved your nickel incident!!! I always feel much better and am usually relieved to know I am NOT THAT BAD of a parent after watching those Nanny shows....oy vey!